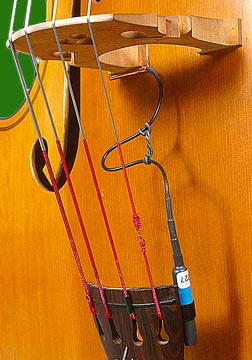 acoustic transducer was designed by Ned Steinberger in collaboration with David Gage. The Realist is available for bass, cello, violin and viola and can be custom fitted for a variety of other acoustic instruments including banjo and kora. "This pickup is the result of an intensive collaboration between myself and luthier David Gage. He is one of the first people from the acoustic bass scene to reach out and support my work on the electric upright. It was the piezo bridge pickup in particular that caught his interest because of the full, rich tonality, especially when bowed, that seemed to be missing in other electric instruments. We got to talking about the dissatisfaction so many acoustic string players have with the sound of the pickups that are available. The next thing I know, I've got one of David's prize instruments in my studio, and we are testing all kinds of old and new variations of pickup designs. The result is The Realist™, which is an evolution of the original pickup in the NS Double Bass. Three elements combine to give The Realist™ the exciting tone that has so many players raving. The first is finding the right structure within and around the piezo crystal to respond optimally to the acoustic resonance of the instrument itself. This involves endless comparisons that I wouldn't wish on my worst enemy, and we have David's sensitivity and patience to thank for the excellent result. We owe a debt also to the many fine players who were corralled into helping evaluate the various options. Second, placing the transducer under the foot of the bridge puts it exactly where the sound is transferred from the strings to the sound board. This is definitely where the action is, and the rich, powerful response, both pizzicato and bowed, testifies to this simple fact. The output level directly from the pickup is unusually high, and as a result the signal to noise ratio is also very high, so no pre-amp or other active, battery powered gear is necessary. Just plug it in! The copper foil sandwich construction is the third key element in the system. It provides total shielding to eliminate hum from light fixtures and other electrical or radio interference. It is flexible enough to conform to the curve of the top of the instrument, so that the full pressure of the bridge is concentrated evenly onto the piezo surface. But all this technical stuff is beside the point when you are on stage or in the studio, the pressure is mounting, and you need your sound to be there. As both luthier and musician, David has plenty of field experience in the ongoing battle for tone. " "Whether it's with my Czech or Italian bass, the character of the instrument remains intact. The bowing is perfect. The Realist also works great in the studio. It's the best pickup, period." "Put simply, it's the best pickup I've every heard..."
"Whether playing pizzicato or arco, The Realist in my opinion is the best sounding pickup on the market." "The best Arco sound of them all. The Realist? sounds the most like a microphone without the problem of feedback." "The most natural sounding pick-up I've ever heard. You wouldn't believe the sound of it through my rig. It feels great -- I'm totally into it. I'm really happy with it. It's easy, I love it. I can go from pizzicato to arco without any hesitation"